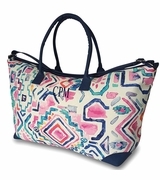 Bold and not shy is the fashion forward statement that this southwestern pattern weekender duffle bag will make. With a dramatic appeal in a diamond geometric pattern in white and indigo blue. This will become your favorite fun travel tote. A must-have duffel for a weekend away, or pack it full for a beach day with the family. It offers a spacious easy-to-access main compartment that will hold all you need and more. The two sturdy straps in a contrasting deep blue will make this duffle an easy over a shoulder carry. 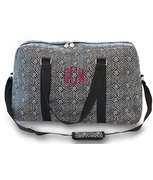 The southwestern diamond duffle measures 28"W x 15"H x 9" across the bottom. Inside zip pocket and zipper closure. Over the shoulder strap.